The following matrix is provided as a guide to help show the appropriate response to specific elder abuse issues. But before we show the matrix, we wanted to mention another resource for deciding how the respond to abuse and neglect situations for vulnerable adults – the PGT’s Decision Tree. 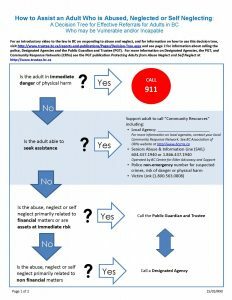 NOTE – for adults who may be vulnerable or incapable, see also the two-page “Decision Tree: Assisting an Adult Who is Abused, Neglected or Self Neglecting” prepared by the Public Guardian and Trustee of BC. The Decision Tree outlines which agencies to contact to make the most effective referrals. To access the Decision Tree and video package, click here. Imminent or ongoing injury or damage to person or property. Neglect or self-neglect that is causing or is likely to cause serious physical, mental or emotional harm or substantial damage or loss in respect of the adult’s financial affairs. – from section 44 of the Adult Guardianship Act. Pressuring an older person to sign documents that they do not have the capacity to understand. • For abuse of a power of attorney or representation agreement, referrals can be made to Assessment and Investigation Services (AIS) at the PGT. •Ability to temporarily freeze assets in an emergency PGT Act, s. 19. •Special investigation powers PGT Act, s. 17 and 18.